Over forty works, exploring the human act of making sense out of sensation. From the sheer mechanics involved as phenomena is apprehended by the senses, to the work of the brain receiving, sorting and reconstructing the neural impulses what are the factors that make up our perception of the world. What are the embedded, skeletal structures through which we filter the millions of bits of incoming information and on whose bones are fashioned our interior sense of the exterior world? What is the role of pattern and how do we make meaning from the what has been taken in by the senses; What are the navigational charts and strategies that allow us to understand the flow of being alive? Everything One-of-a-Kind to collect and enjoy. 27 Artists open their homes and studios. A short journey through an evolution of ideas. International Art Gallery, Vancouver, B.C. ELGIN ART GALLERY, Surrey, B.C. Floral paintings in all three mediums; water colour, acrylic and oil. in White Rock. It was a great opportunity to be open to the public for an extended period of time with studio mates Chris MacClure and Marilyn Hurst . at the Scottsdale Art School in Arizona. getting the hang of it. Last January the workshop was with Daniel Keyes. If you love floral paintings, look this painter up. His work is truly gorgeous! keep subscribers up to date on works coming out of the studio. 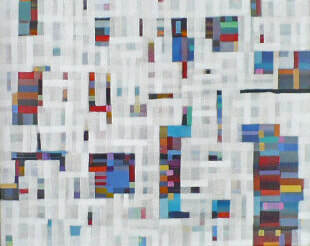 Memory acrylic on canvas 10x8"
Three Days Acrylic on canvas 20x24"
A Small Thought acrylic & wood 20x16"